In recent years, there’s been plenty of talk about a rising tick population across America. In part a result of this growth, “vector-borne” illnesses (or illnesses passed by blood-feeding) have tripled in the US since 2004. Because Coloradans tend to spend so much time outside, this can pose a major health concern. In Colorado, ticks are known to carry two viruses – Colorado tick fever and the more serious Powassan virus. They also carry Rocky Mountain spotted fever – a bacteria disease – and tularemia – an infection. There’s also debate about whether or not Lyme disease – perhaps the most well-known tick-spread illness – is present in Colorado. Recognizing the symptoms of these conditions can be just as important as knowing how to prevent getting bitten, as some illnesses can be life-altering in a big way and at times, life-threatening. The photo on the left shows symptoms of Lyme disease, a vector-borne illness that ticks spread. The photo on the right shows how small a tick can often be. Photo Credit: Left: monkeypuzzle (Flickr); Right: ArtBoyMB (iStock). 1. Warm Temperatures – Ticks are dependent on warm weather to survive and when a year as been warmer, ticks thrive. Trends in Colorado have shown a warm year. 2. Population Growth – As more people build, more wild areas home to ticks are torn down. After the new construction is complete, ticks tend to stick around their stomping grounds. This is one reason to be especially cautious of ticks on pets, even if you’re in a neighborhood. If it’s a new development, there’s a good chance the ticks are still there. 3. Booming Deer Populations – Growing numbers of deer in Colorado, especially in urban spots like Colorado Springs, mean that hosts are easier to find for ticks. This becomes an even bigger issue when wildlife and humans start to mix. 4. Increase in Outdoor Recreation – As more potential hosts (humans and pets) come to the tick’s natural habitat, there’s a greater potential for the tick to latch onto something that will take them to another location. This makes it easier for ticks to spread. 5. Birds Altering Habits – A side effect of warmer temperatures, some birds are taking new routes on their migratory patterns. This makes it easier for bird-transported ticks to spread to new areas. NEXT… let’s take a look at ways to prevent tick bites. According to the CDC, there are a few key tactics that help decrease the risk. 1. Avoid Direct Contact – If you want to avoid ticks, avoid the places they hang out. Stay on the trails, avoid brushy areas, and don’t walk through tall weeds or grass. 2. Use Repellent – Products that contain DEET or permethrin are shown to prevent tick bites. DEET can be used on skin and permethrin can be used on clothing, remaining protective through several washes. Keep in mind that repellent can be sprayed on tents and other gear. Here’s a tool designed by the EPA to help you find the right repellent fit. 3. Wear Protective Clothing – The less skin you’ve got showing, the less likely you are to get bitten. Things like long-sleeves and hats are often the first-line of defense against tick bites. 4. Inspect, Inspect, Inspect – Once you’re headed back inside from your outdoor activity, closely inspect yourself and pets that may have been exposed to ticks. Ticks tend to like darker spots on the body – like the belly button – and hair. LAST… let’s look at how to identify symptoms of a bite. While symptoms vary by condition, here are a few common symptoms to look for. Author’s Note: The following medical information is not expert opinion, this content is simply based on experience in the outdoors and research on the topic. If you’d like more information, please consult a medical professional. Additionally, here’s a link to the official CDC page about ticks and their bites. 1. 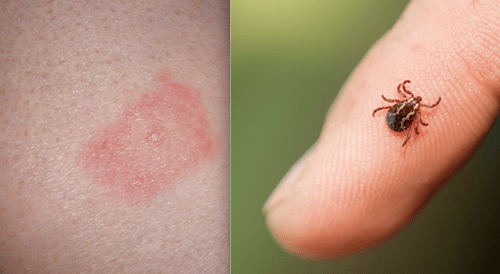 Fever and Chills – This is the most common and consistent symptom of a dangerous tick bite. If you start feeling either of these things and think there’s a chance you’ve been exposed, keep in mind that the symptom could be from a tick bite. Keep a close eye out for additional symptoms and consider consulting a medical professional. 2. Aches and Pain – Things like muscle/joint pain, headaches, and fatigue can be a symptom of a tick bite. Severity tends to vary wildly and awareness of it often depends on the individual’s pain tolerance. 3. Rash – Different tick-borne illnesses can carry different and distinctive rashes. For example, a Lyme Disease rash can carry a bulls-eye shaped rash, while Rocky Mountain Spotted Fever can fill someone’s arm will tiny sores. If you develop a strange rash after being outside, keep in mind that it could be from a tick bite. Self-diagnosis can, at times, be effective by photo comparison, though getting an expert opinion is never a bad idea. Just because tick-season might be a bad one this year, it doesn’t mean you should avoid the outdoors. Just be aware of tick-borne illness symptoms and how to prevent bites. If you exercise caution, your chances of a close encounter with a dangerous tick are immediately lower. If you think you’ve been bitten and are showing signs of symptoms, consult a medical professional. Author’s Note: This medical information is not expert opinion, this content is simply based on experience in the outdoors and research on the topic. If you’d like more information, please consult a medical professional. Additionally, here’s a link to the official CDC page about ticks and their bites. *Note: The term “tick explosion” comes from an interview by Boston 25 in which a tick expert was discussing a widespread boom in tick population. 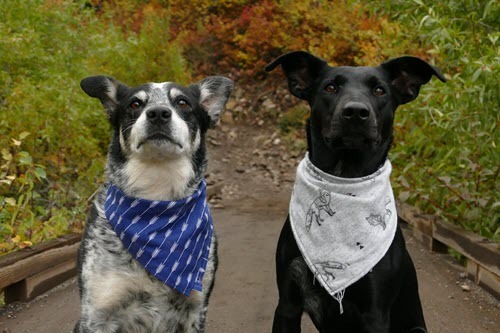 FCVC Note: Want to know even more about Colorado ticks and fleas? We have a fact sheet from the CSU Extension Office that has everything you could want to know about Colorado Ticks and Fleas at our More Resources page.